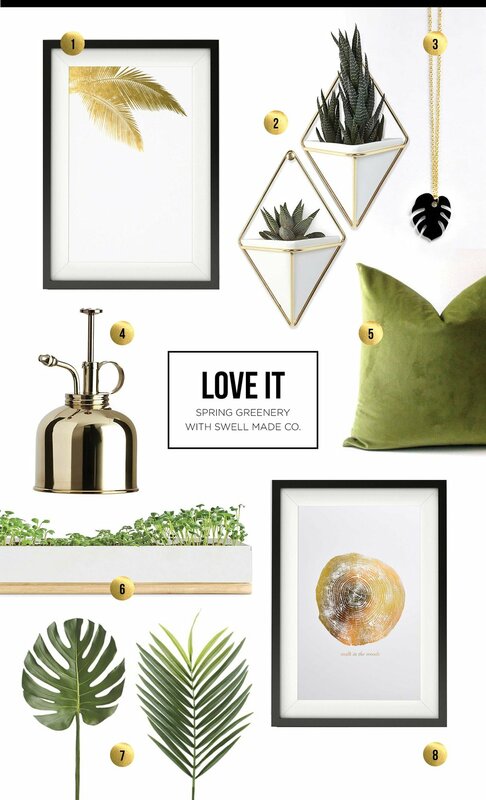 LOVE IT - Spring Greenery with Swell Made Co.
Spring is on the way which has me dreaming of everything and anything green. It's only natural, right? After days of grey skies and snow, I always feel "ready" for the shift to warmer days, more sunlight and green spaces. I'm also crushing on green because Pantone's colour of the year for 2017 is Greenery. "A refreshing and revitalizing shade, Greenery is symbolic of new beginnings. Greenery is nature’s neutral. The more submerged people are in modern life, the greater their innate craving to immerse themselves in the physical beauty and inherent unity of the natural world. This shift is reflected by the proliferation of all things expressive of Greenery in daily lives through urban planning, architecture, lifestyle and design choices globally. A constant on the periphery, Greenery is now being pulled to the forefront - it is an omnipresent hue around the world." Brass Wall Planters by Umbra. Hang easy-to-care for plants, like succulents and air plants to bring some greenery into your space. These planters add dimension to any wall. On their own, or as part of an existing gallery wall. Palm Leaf Pendant by Swell Made Co. This little pendant shows a love for plants. Brass Plant Mister by CB2. Care for your plants with this classic brass mister. It delicately mists plants so they can thrive. Vevlet Pillow found on Etsy. Maybe you can't quite splurge on that green velvet couch, but you can add a splash of green to any room with this lush velvet cushion. Micro Greens Planter Kit found on Uncommon Goods. Grow your own micro greens with this stylish and functional planter. They look great and taste even better. Plus, they pack a a lot of nutritional punch. Eating your greens is easy. Add them to sandwiches, soups, pastas and salads. Faux Palm Leaves by CB2. If you're not a green thumb, add these faux palm leaves in a vase for a simple (no-fuss) splash of green. You can always opt for the real deal too. Just buy stems from your local florist. Walk in the Woods Art Print (11x14) by Swell Made Co. Nature's simplicity is stunning. This art print will remind you to get outside. Being among the trees is good for your mind and body.